I discussed the explosive popularity growth of the Evil Dead films - and their subsequent commodification - at length in a recent Points of Articulation, so I will spare you another exegesis on Sam Raimi's beloved cult trilogy. Since I've got a number of reviews to get through this week, I'll take the somewhat unusual tack of cutting right to the chase. 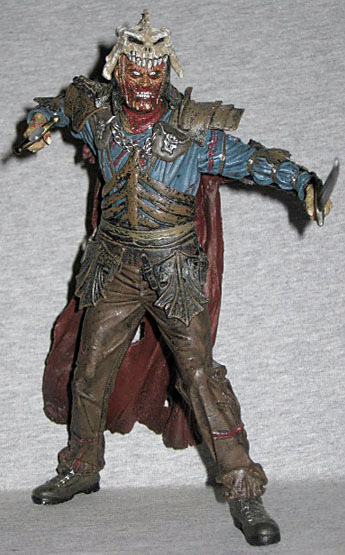 Evil Ash was produced at the height of McFarlane Toys' obsession with statuesque figures. It's a sad irony that Ash and Evil Ash, two of the most requested toys ever, have the misfortune to be two figures that hardly deserve the "action" modifier. Ash hardly moved, and Evil Ash moves even less. He's so pre-posed that he looks terrible in any position other than the one he's clearly intended to be in - which is particularly odd since, in a break with tradition for McFarlane Toys, the pose does not seem to be based on anything seen in the film. The only room for creativity in posing is the wrists; once you've successfully spent three hours jamming those sword hilts in there, then you can bend them up and down to taste. The swords, by the way, are well-made and accurate to the film, though they're pretty basic weapons. The one with the solid blade just pushes into his hand, while the one with the slit down the center has a removable pommel. "Removable" in this case meaning "easy to lose," so do be careful with it, won't you? There's a loop on his belt meant to sling one of the swords, but you'll never be using it, since his empty hand would then look supremely silly. Of course, the lack of articulation is somewhat made up for by the fantastic sculpt. This figure's sculpt is unquestionably better than that of Ash's (perhaps it's just easier for McFarlane sculptors to capture a disgusting, bleeding, rotten face than Campbell's smooth, chiseled good looks). The detail is incredible, right down to the little ridges on his bone-helmet. 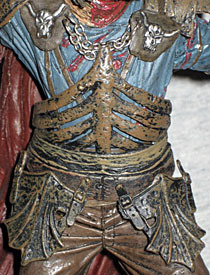 The paint applications are also possibly the best I have ever seen from McFarlane (and that's saying something). I can't find a single fault with it. This is about as realistic as one can get in the 7" scale. 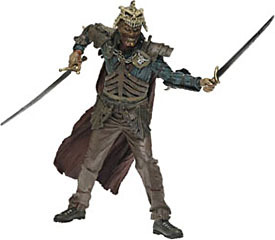 Actually, this figure looks much more realistic than those dopey, stiff-looking dolls that inhabit the 12" realm. Evil Ash's armor was based on 15th century Italian and German armor, which makes it a tad anachronistic for the alleged 1300 AD setting, but to complain about that would be missing the point of a fantasy film, wouldn't it? The original concept was fossilized armor, steel fused with bone, with the color scheme black and rust with a little bit of shine here and there. Well, this may be my shortest review ever. I have nothing else to add. This is a really great-looking statue. Any Evil Dead fan will probably want one, as will many horror fans and horror figure collectors. It's not an action figure, but it's a great... collectible.